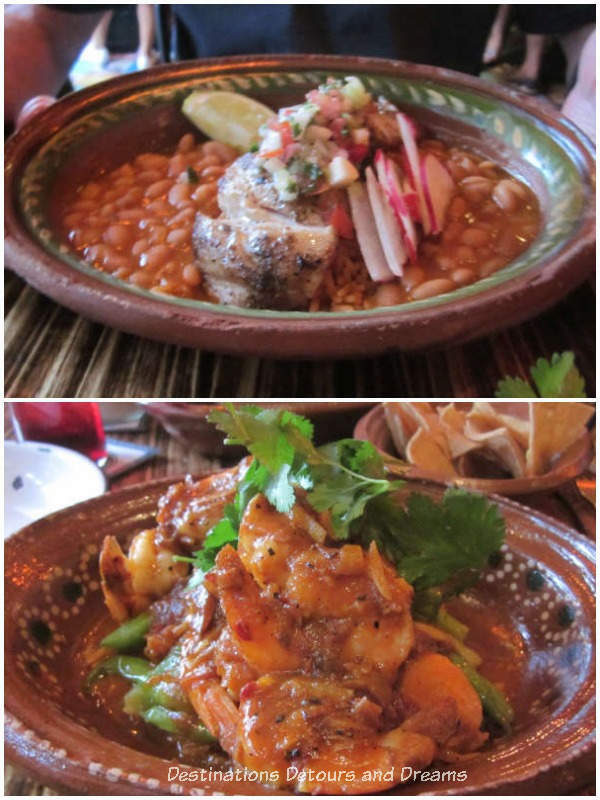 One of the many things that impressed me when I visited Puerto Vallarta, Mexico was the food. There are an incredible number of places to dine and meals were fantastic everywhere I ate. I’ve been torn between wanting to share my dining experiences and feeling completely inadequate to even begin a post about food in Puerto Vallarta because there are so many restaurants I have yet to visit. Proximity to where one stays and recommendations by friends are often key factors in choosing where to eat during travel. That was certainly true of my stay in Puerto Vallarta. I was in the Romantic Zone and many of the restaurants I ate at were in that area or near to it. Still, I only sampled a fraction of what was available. 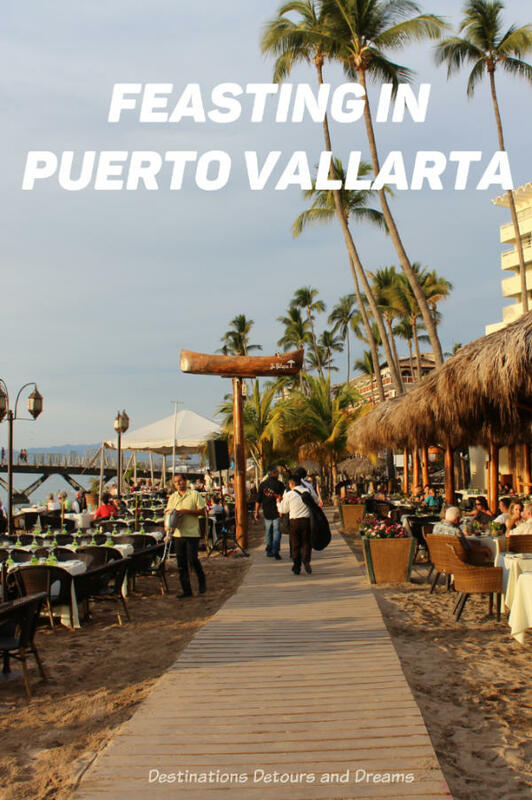 Even though I cannot write a definitive guide to dining in Puerto Vallarta, I feel my experience can provide visitors to Puerto Vallarta ideas for their own dining choices and help get them started discovering the tastes of Puerto Vallarta. 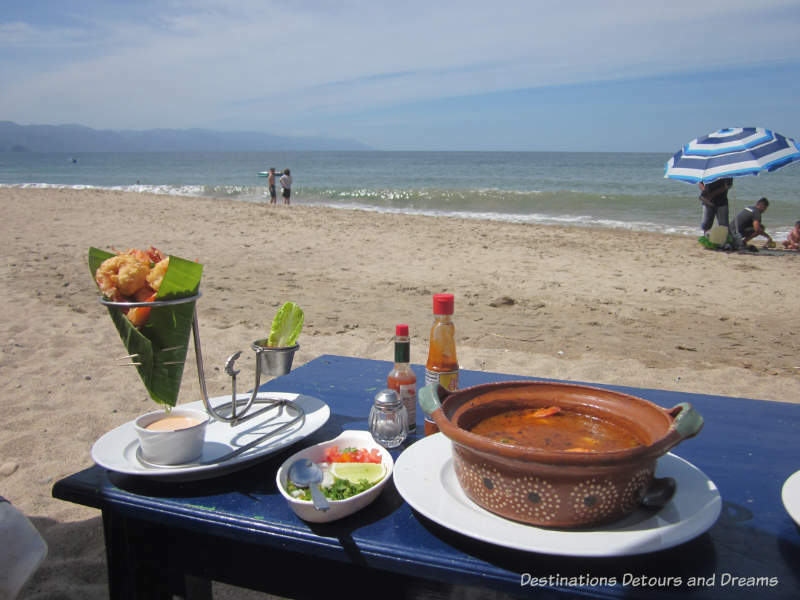 You’ll find many types of food in Puerto Vallarta restaurants, from Italian to Chinese to American burgers and more. But Mexican and American Mexican are the most prevalent. Dining options include elegant restaurants, casual cafés, and street vendors. Fish, especially large and lovely shrimp, feature prominently, although you will also find plenty to keep the non-fish eater happy. 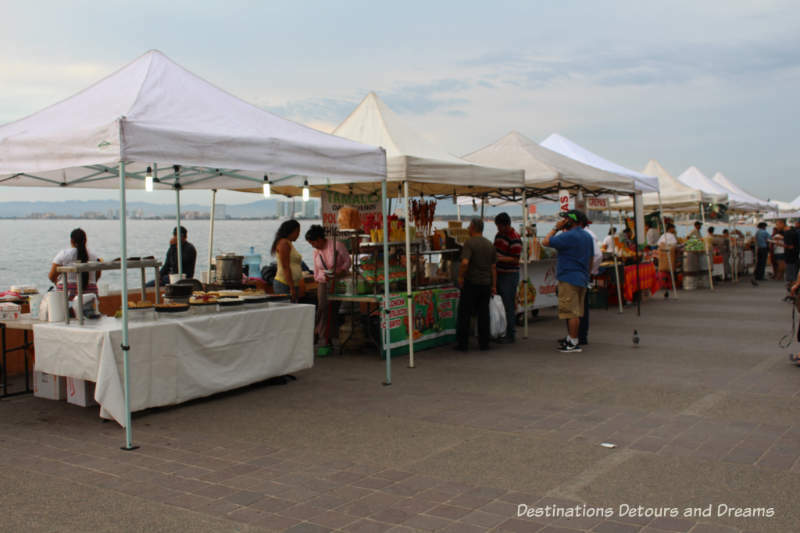 Stalls lined up along the southern stretch of the Malecón in the evening offer a variety of food: crepes, pastries, Mexican corn on the cob, hot dogs, burritos, candy and more. During the day on the beach, vendors stroll by offering skewered shrimp (I didn’t have any, but my sister said they were excellent), fresh fruit, oysters, and muffins. The best fish tacos I ate were from a food stand set up alongside the Saturday morning market in Lazaro Cardenas Park. Food trucks offer tacos and other food throughout the city. Some people may be wary of eating any kind of street food, but you often have a better opportunity to see exactly how your food is being prepared than in many restaurants. Check for cleanliness standards, food freshness, and safe food storage and preparation. 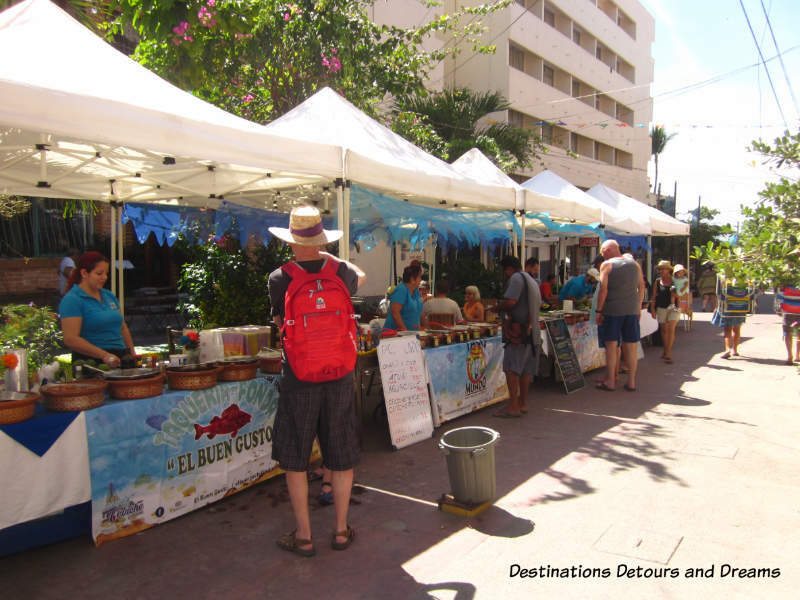 Restaurants line the beach in the Olas Altas and Los Muertos beach areas. Surprisingly, the street vendors strolling through the tables on the beach include those selling food items. 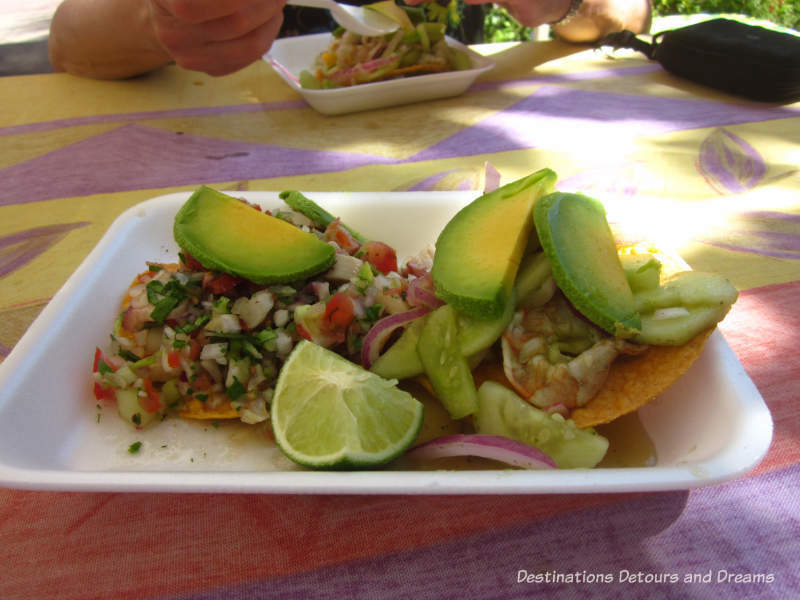 Ceviche and aguachile appear on many menus usually served on a tostado, a deep-fried tortilla, with a slice or two of avocado on top. (Avocado is served with everything!) Ceviche is raw fish cured in citrus juice (usually lemon or lime) and spiced with chile. Other ingredients may include onions, tomato,and cilantro. Aguachile is a spicier version that is marinated for less time and usually includes cucumber. I became a regular at Tuesday’s Ceviche and Aguachile Day. 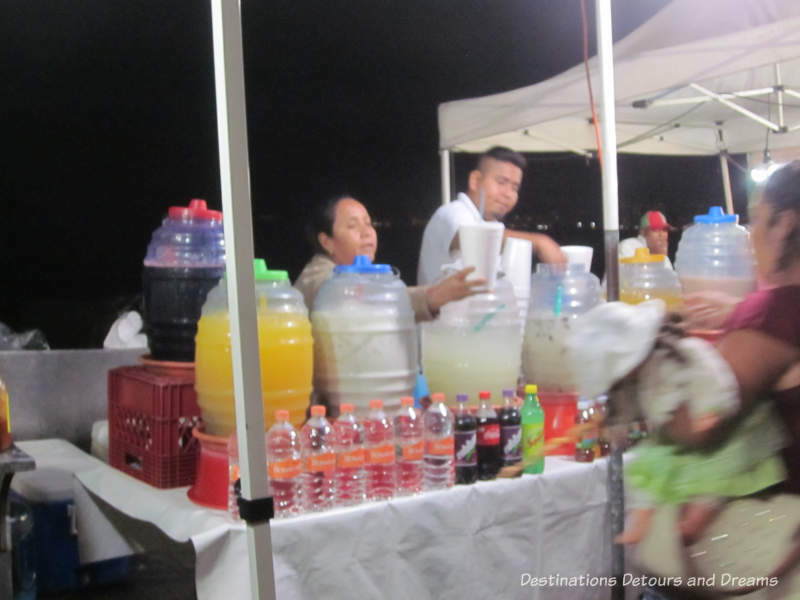 From noon to 6 pm, several restaurants set up stalls on Francisca Rodriguez by Los Muertos Pier in the Romantic Zone. Variations of ceviche and aguachile for sale contained shrimp, octopus, or other types of fish. Some included coconut or mango. Upon the recommendation of a waiter (at a restaurant along the Malecón whose name I can not remember), I tried a dish I had never heard of before: molcajete. 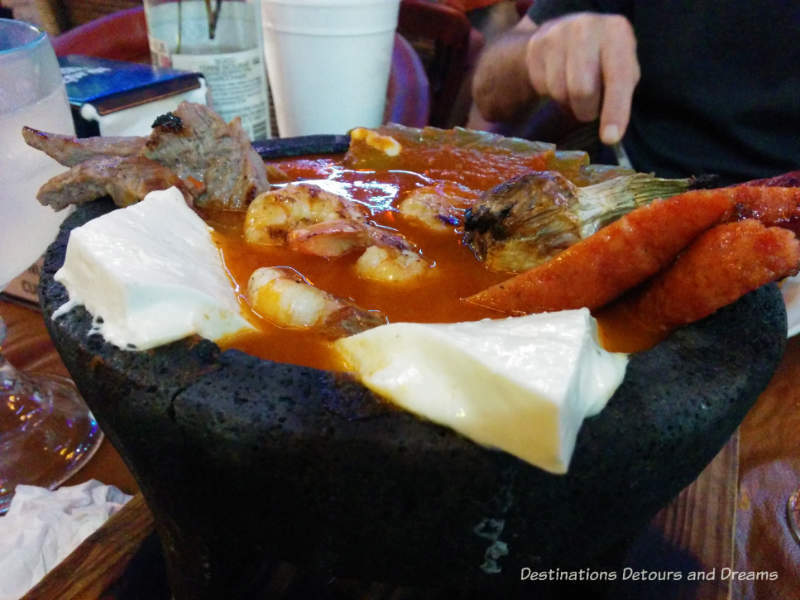 A molcajete is actually a stone tool, the traditional Mexican version of a mortar and pestle. On a menu, it refers to a meal served in a heated molcajete dish lined with melted panela cheese. The dish contains meat, shrimp, grilled cactus, roasted garlic, and more panela cheese, all in a tomato, garlic, and pepper sauce. It was tasty, although I did not care for the grilled cactus, aka nopal. Nopal is touted for its antiviral and anti-inflammatory properties. Someone I met told me she chops it up and adds it to all kinds of dishes, like scrambled eggs. I might prefer to try it that way. 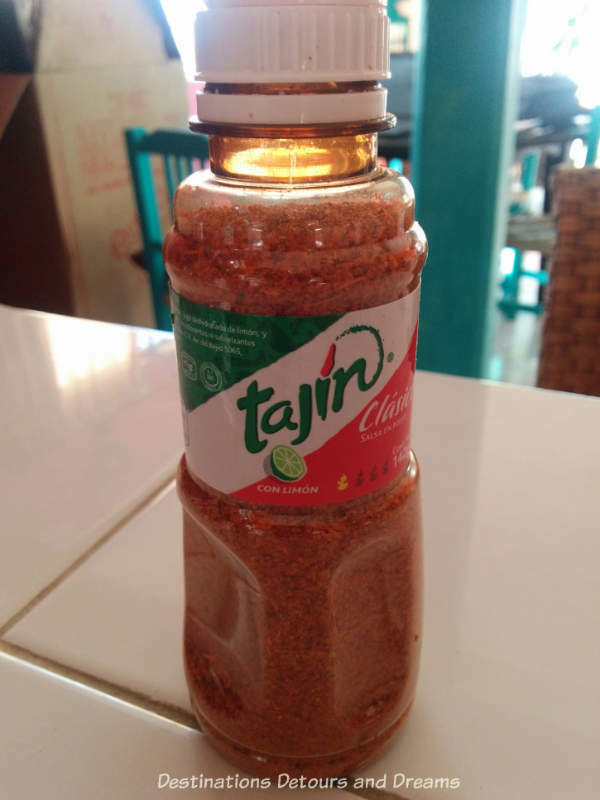 Tajin is a seasoning made from chili peppers, lime, and salt. On a friend’s recommendation, we picked up a jar to use when we cooked in the condo instead of eating out. “You put it on everything,” she said. I also saw Tajin listed as an ingredient or flavouring on some restaurant menu items. 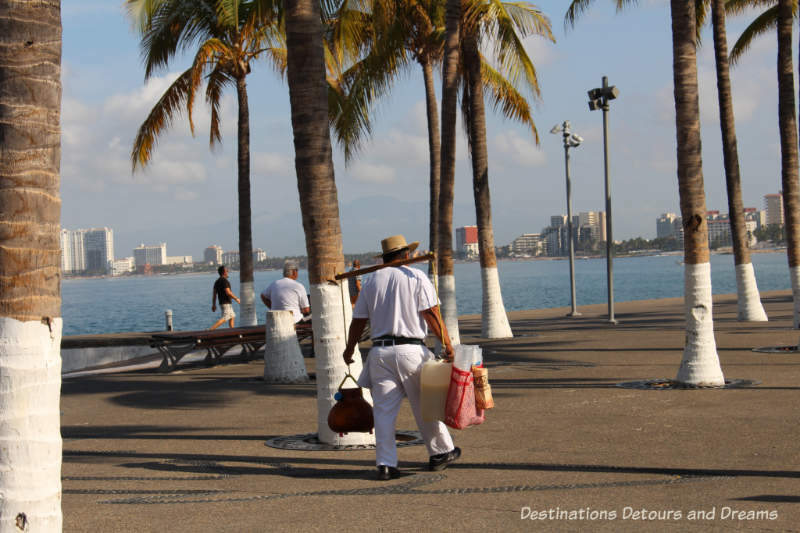 The fellow strolling the Malecón in the above photograph is selling tuba, a drink made with coconut sap and apple vinegar. It is often served with pieces of apple and walnut. It is said to be refreshing in the summer. I tried it and can understand how it can be refreshing, although it isn’t something I’d drink a lot of. I preferred the jamaica agua fresca. 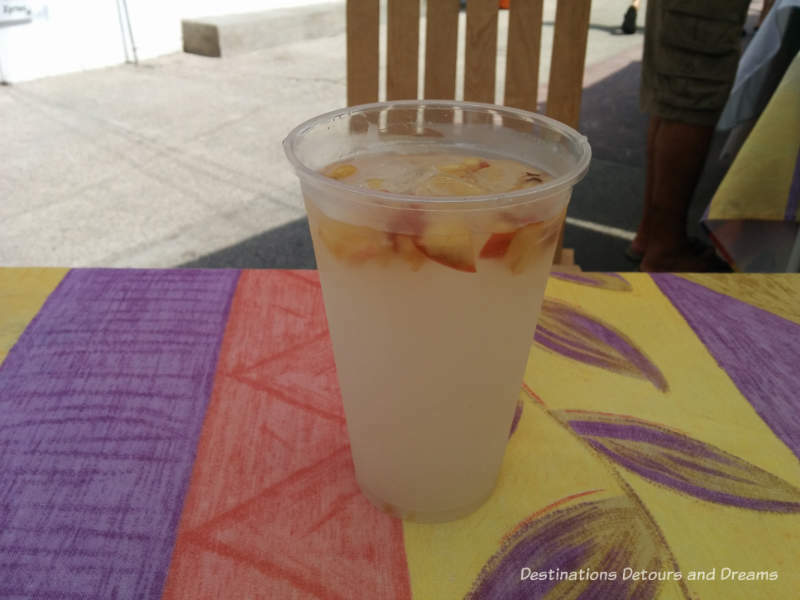 Agua fresca is a non-alcoholic drink made with fruit, sugar, and water. Hibiscus flowers are the basis for the purplish-red jamaica agua fresca. You may sometimes see it called agua de jamaica. Other flavours include pineapple, mango, and watermelon. My husband’s favourite drink was horchata, a milky mixture of rice and ground almonds. It was not as prevalent as agua frescas and we never saw it in restaurants, only at street stalls. 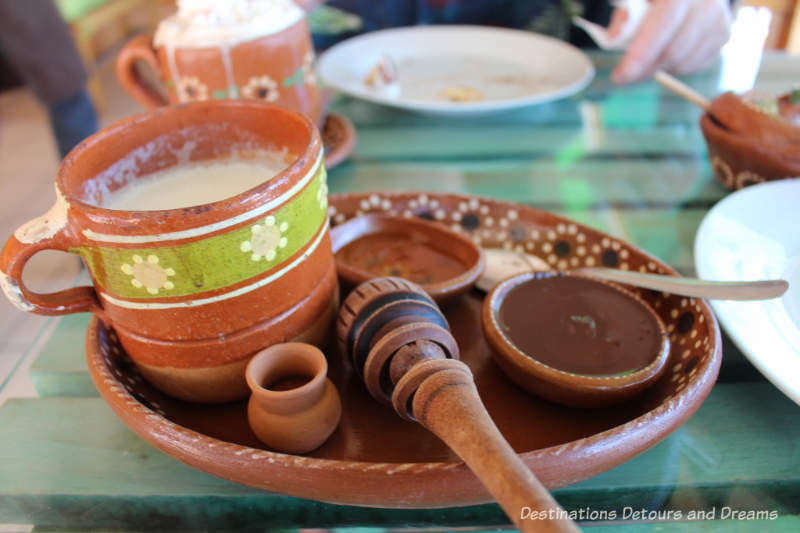 Another Mexican drink that we did not try is tejuino, a cold beverage made of fermented corn. Lemonade was widely available and had a delightful tang. 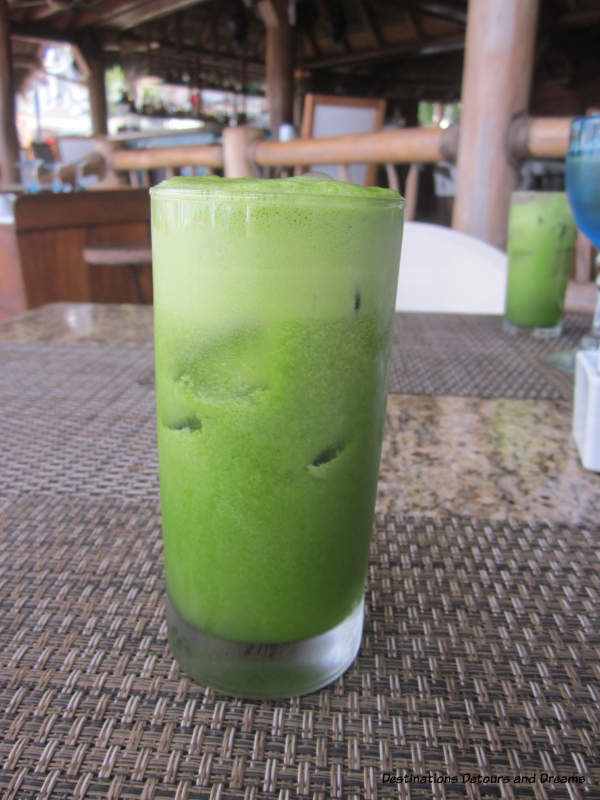 Green juice was on the menu in several restaurants. The version I tried, which was surprisingly refreshing, was made with parsley, celery, lime, pineapple, orange, and sugar syrup. I suspect most versions contain similar ingredients. And of course, margaritas, beer, tequila, other spirits, and wine are readily available. La Bodeguita del Medio is a Cuban restaurant and bar along the Malecón in El Centro. The ceviche snack I had here was very good, but I didn’t try anything else. 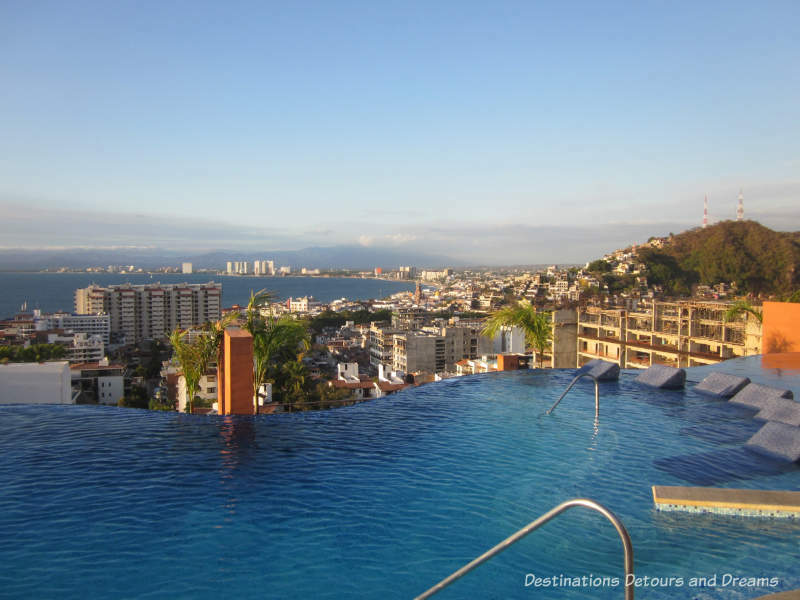 Seats on the second story offer great views of the Malecón and Banderas Bay. The walls are covered with names of people who have visited. The wait staff will bring you markers to add your name to wall, if you want. There are live bands playing Cuban music in the evenings. Many restaurants and bars offer live music. 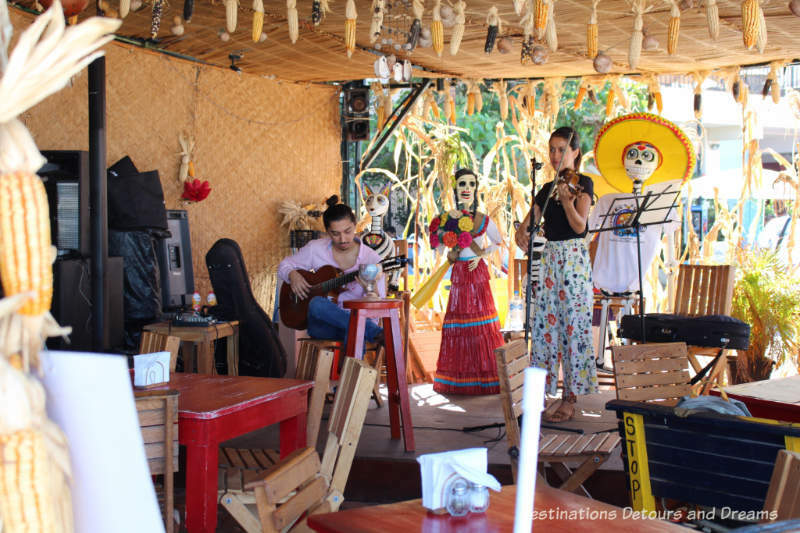 We liked to have a drink at Cuates y Cuetes along the beach in the Romantic Zone and listen to their jazz musicians. Pipis in El Centro is a popular and lively restaurant featuring Mexican food and strolling musicians. This is not the place to come for a quiet conversation. It is loud, but the food is excellent. Portions are generous. My sister and I shared an entree and had plenty. Be prepared to wait in line in the evenings. Guacamole prepared at the table at Pipis. 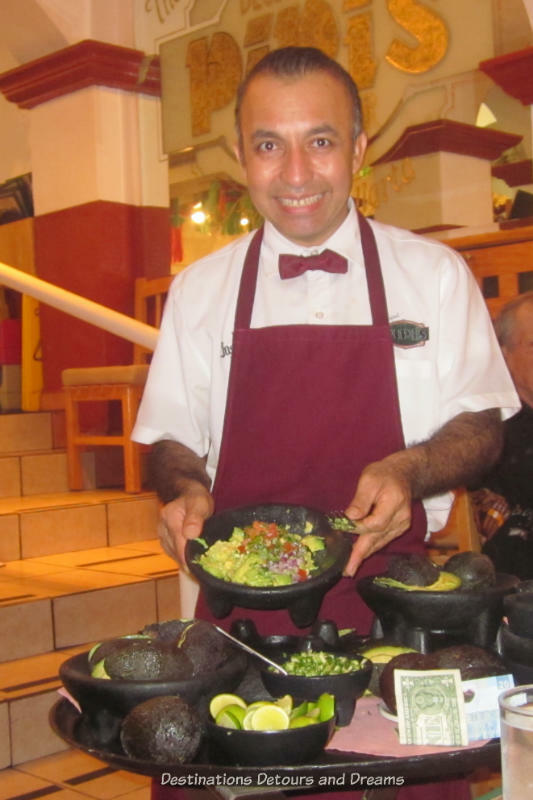 Guacamole is prepared in front of you at many PV restaurants. 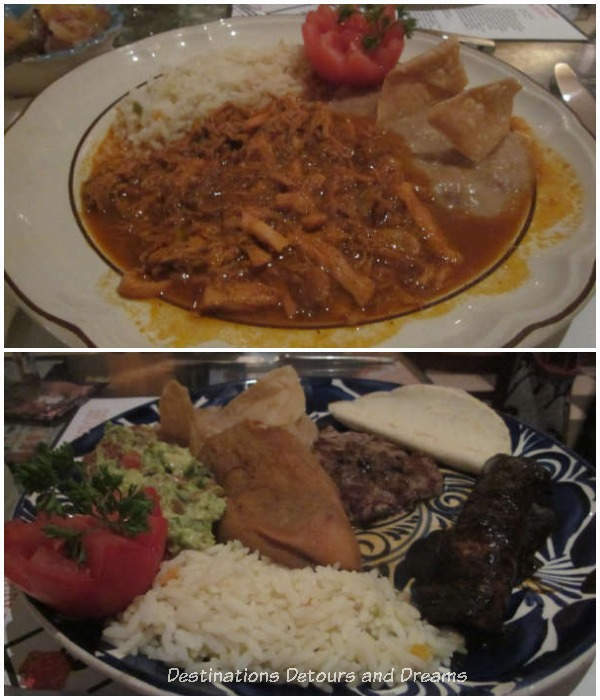 Another popular place for good Mexican food is El Brujo Restaurante in Colonia Emiliano Zapata. The menu and portions are large. Service was quick when I was there. Café Bohemio in the Romantic Zone is open evenings Mondays through Saturdays. Its varied menu contains Mexican dishes, Italian dishes, Cuban pork chops, Korean ribs, chicken satay, and even liver and onions. I had the Paella Veracruz, described as “Spanish paella with a Mexican flair.” It was fabulous. Café Bohemio is a popular restaurant. You may wait for a table. It appeared that many of the patrons were regulars and were well-known by wait staff. A couple of people recommended Joe Jack’s Fish Shack in the Romantic Zone on Basilio Badillo (known as Restaurant Row). It also gets consistently high ratings online. Ceviche is listed as their speciality. Their fish and chips are also popular, but I had the garlic shrimp, which were very tasty. There are a few non-fish items on the menu for those who don’t like fish, but fish reigns. This is another place that can get busy with line-ups. We had lunch a few times at The Blue Shrimp, located along the beach in the Romantic Zone. This is where we went when we wanted to spend a few hours on the beach. We sat on their loungers under an umbrella and whiled the day away. We ordered a drink or two during that time, but for the most part were allowed to just sit there and enjoy the sun and view. The menu items I sampled here were chicken nachos, tortilla soup, and fish soup. All very good. The ChocoMuseo (chocolate museum) on Josefa Ortiz de Domínguez near the Malecón has a café on its third level serving assorted chocolate dishes. Service was a bit slow, but the café is bright and cheerful with a lovely view of the bay. I had a yummy chocolate taco here. I also had a cup of Mexican chocolate. The chocolate, chili, and sugar were served in dishes beside the hot milk/water and I mixed them into the mug in quantities to my liking. The chocolate was so rich I used very little sugar. I had breakfast twice at Coco’s Kitchen, also in the Romantic Zone. It is open daily for breakfast and lunch. It has a shaded courtyard garden. 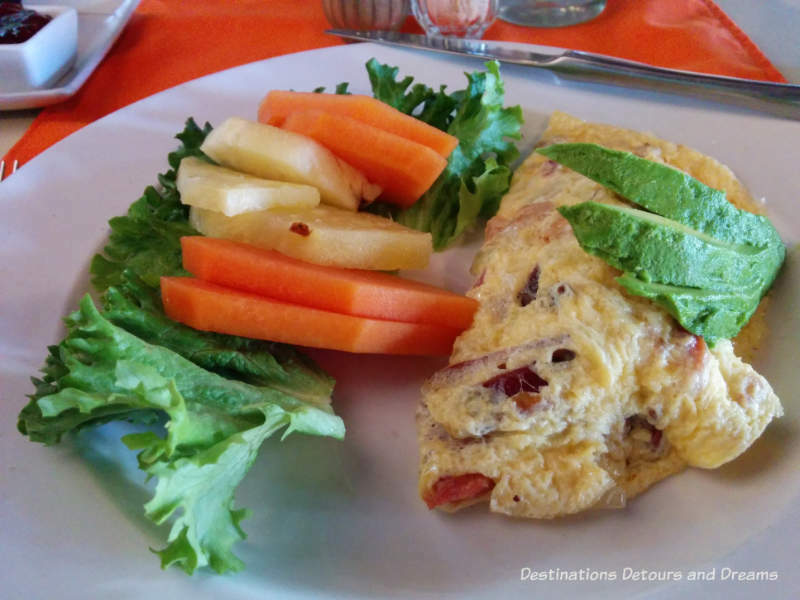 I can recommend the Vallarta omelet (with bacon, onion, and avocado), but all the dishes delivered to nearby tables looked delicious, particularly the Benedicts. 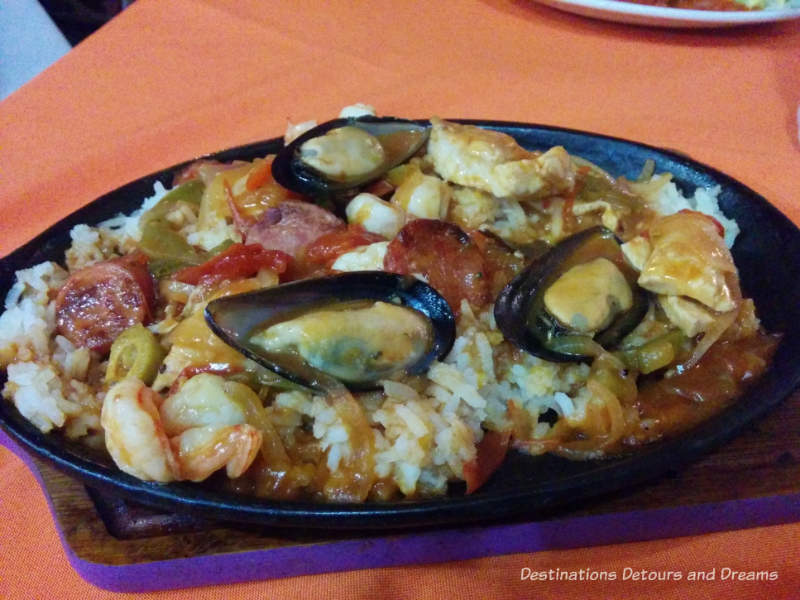 It is a toss-up between two restaurants for the best meal I had while in Puerto Vallarta: the Red Cabbage Cafe and Jorge’s Hideaway Shrimp Shack.The Red Cabbage Cafe is a Mexican restaurant located a little out of the way on the south side of Rio Cuale. It is not particularly far from the main tourist areas, but can be hard to find. We took a cab. The place is colourfully decorated with artists Frida Kahlo and Diego Rivera featured on one wall. The traditional Mayan pork dish I had was delicious. My husband ordered the Mexican platter, which included a little bit of steak, rice, beans, quesadilla, chile relleno, chicken mole, guacamole, chips, salsa, and handmade tortillas. 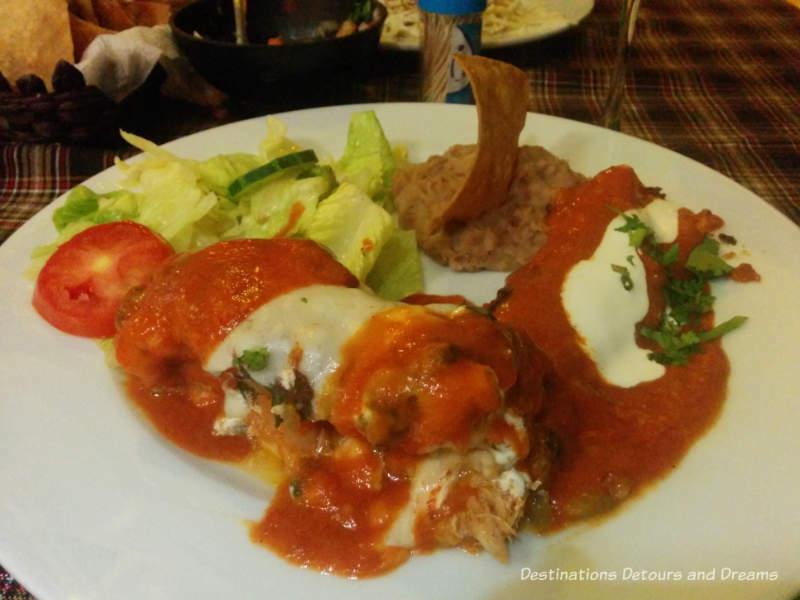 Chile rellenos are one of his favourites and he said this one was perfectly cooked. The steak was incredibly tender. I tasted the mole sauce. It was dark, thick, and scrumptious. Mole is made from chiles, spices, and mexican chocolate. Other ingredients may include garlic, tomatoes, onions, and dried fruit. Recipes vary and usually include twenty to thirty ingredients. Jorge’s Hideaway Shrimp Shack was the other restaurant tied for standing as the best meal I had in Puerto Vallarta. It is a family-owned restaurant in the Romantic Zone open for evening meals. Because it is on a dead-end street (Calle Pilitas), it is not a place you might come across without specifically looking for it. 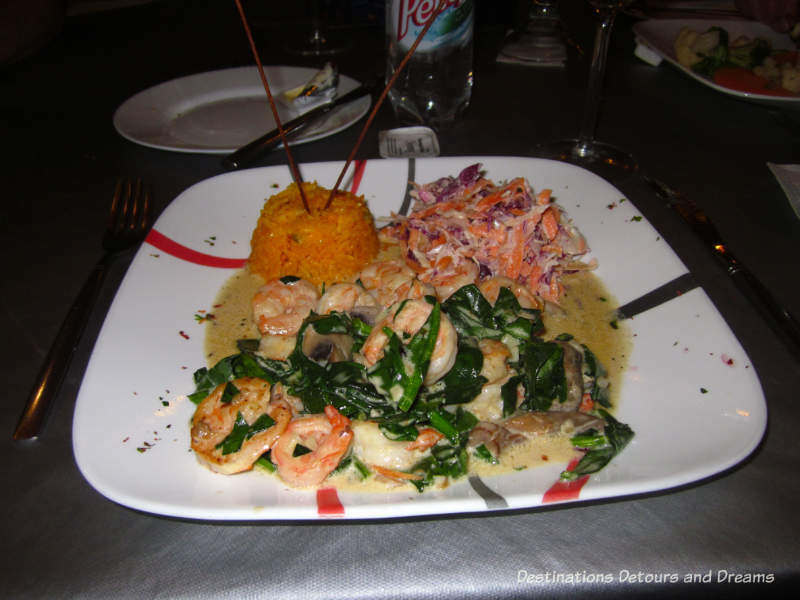 There are menu items other than shrimp and fish, but their specialties are shrimp dishes. Service was friendly. And if you are looking for a drink with a view, try the gay-friendly Residences Sky Bar, located on the top floor of Pinnacle resorts condominium complex in the Romantic Zone. The infinity pool on this level is for use by residents only, but non-residents are welcome at the bar. There is no food service. Go to catch the sunset and bring your camera. There are several restaurants I did not get to, but would like to try on a future visit to Puerto Vallarta. Another recommended restaurant was Gaby’s in El Centro. I walked by it. It has a lovely setting and an extensive menu of Mexican dishes. A couple of people recommended Pancho Tacos on Basilio Badillo. It has limited seating and anytime we walked by it there was a substantial line-up on the sidewalk. The line-up is usually already there when the place opens at 6 pm, but I’m told it moves quickly. Another place where I regularly saw line-ups was Fredy’s Tucan for breakfast. 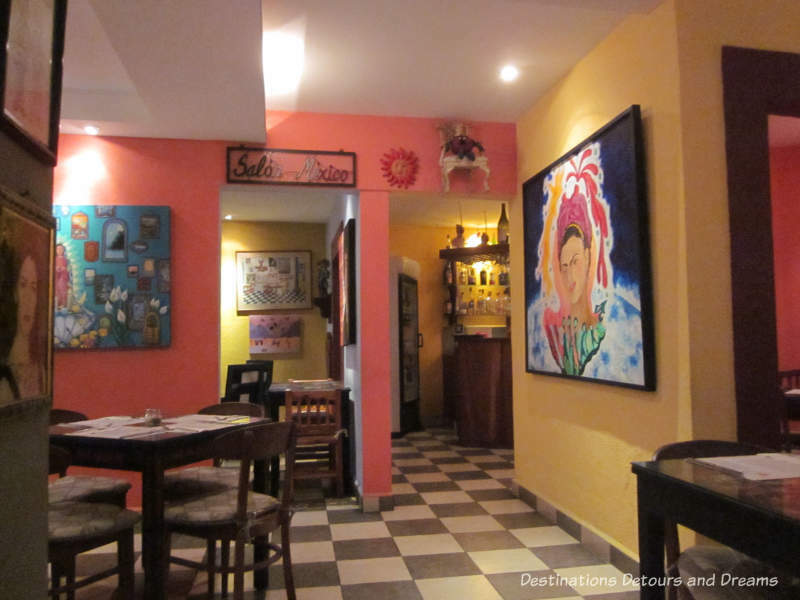 A couple I met at an art exhibition recommended El Mole de Jovita, another restaurant on Basilio Badillo. 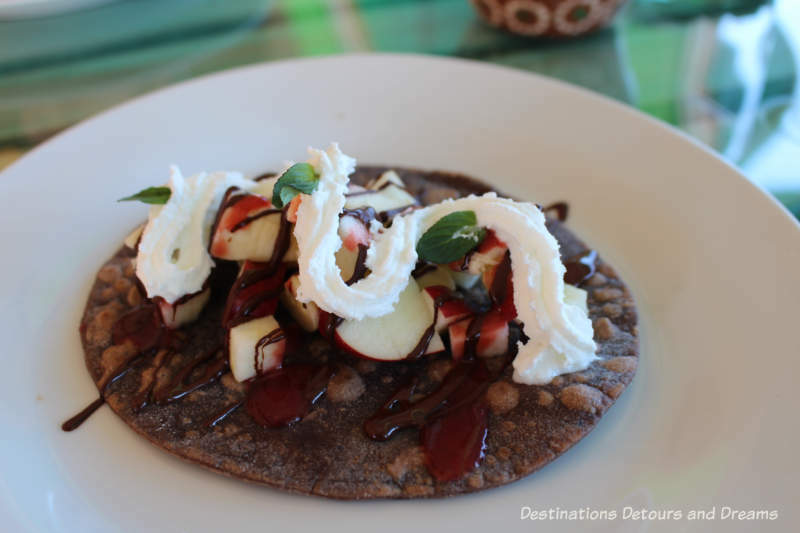 They had been to it on a food tour with Vallarta Eats and suggested it might make the best mole in Puerto Vallarta. El Arrayán is a restaurant in the heart of downtown. It claims to be the best Mexican restaurant in the city. What particularly interests me about this place are the cooking classes it offers. 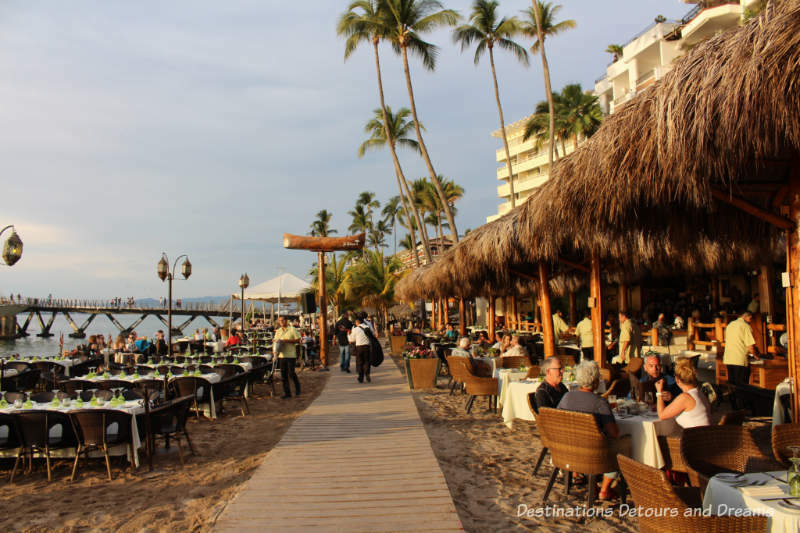 There is no shortage of good places to eat in Puerto Vallarta. There are so many more restaurants to discover. Wow. Everything looks great. Don’t know where to begin. Maybe with some ceviche. Ken, in my opinion ceviche is always a good place to start. I’m seeing a lot of avocado! 🙁 Looks like you did a lot of great eating. Deb, definitely a lot of avocado! It does seem as if we ate a lot. It was a highlight, but we also walked quite a bit and climbed a lot of stairs to offset that. So many great dishes to choose from! There are actually lots of great authentic Mexican restaurants in the Boise ara due to the large influx of migrant farm workers. Not to mention food trucks! Jeri, I wouldn’t have expected to find authentic Mexican food in Idaho. How nice!